How to create (bet) sports slip? On the webpage "WWin/Sports" choose the desired odd by clicking the mouse button on it. 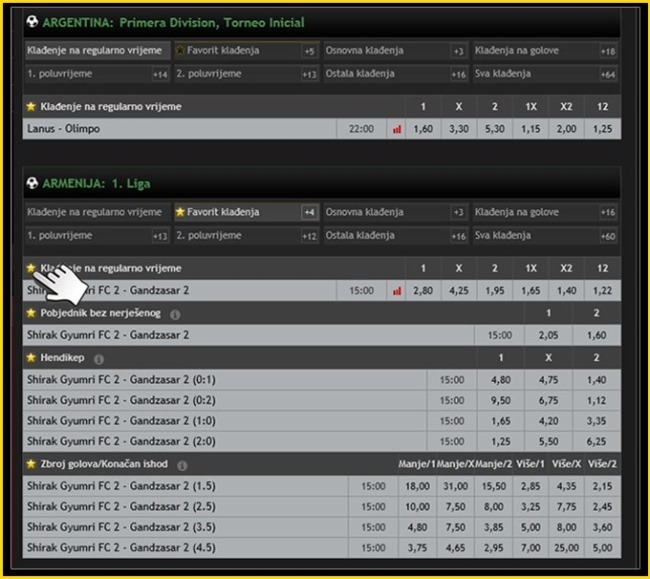 On the right side of the screen a slip will appear with Your bet. Add bets by desire, choose if You want to play system or single slip, in box “Stake” type the amount of money You want to bet on that slip and press the button “Bet”. After that a new window will open so You can review Your slip and by clicking “Bet” You finish the payment. After You have received confirmation that the slip is successfully, Your account will be deducted for the amount You entered on the slip. 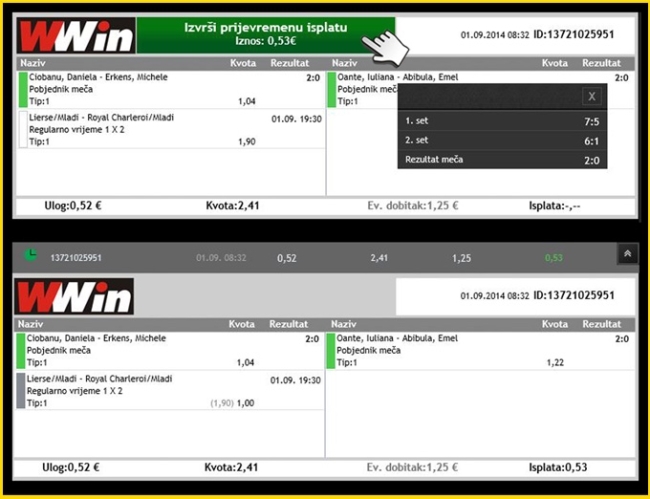 You can follow the status of Your slip in column "My games/Sports bets". How to add a league in the option ''My favorites''? If you wish to add any league to the ''My favorite'' option, you have to click the star next to the deisred league, as shown on the picture below. Notice: In order to have the ability to add leagues as favorites you have to be logged in to Wwin with your user account. After a league had been added in favorites it will be visible always when there is at least one bet available from the chosen league. How can I add a bet to the option ''My bets''? If you wish to add any bet to the ''My bets'' option, you have to click the star next to the deisred bet, as shown on the picture below. 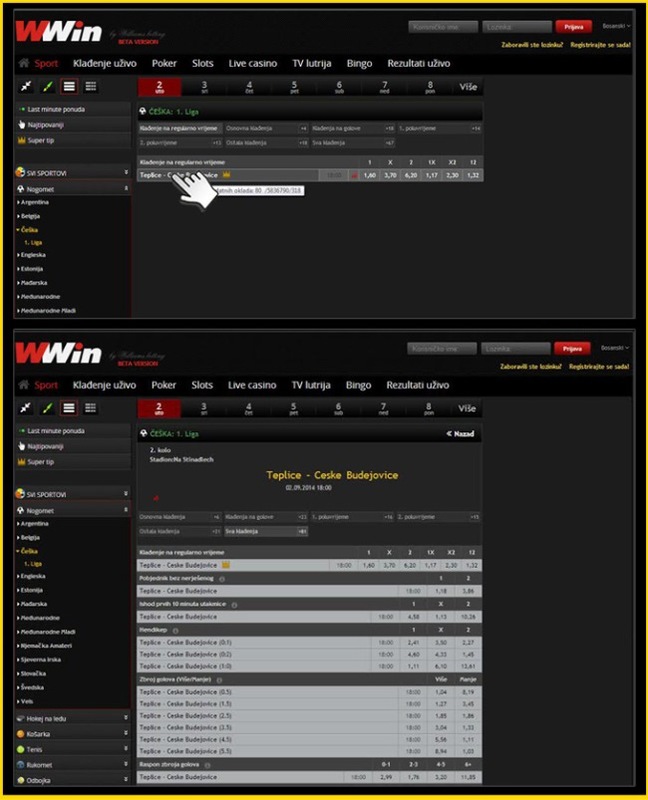 Notice: In order to have the ability to add bets as favorites you have to be logged in to Wwin with your user account. After a bet had been added in favorites a new group will show ''My bets''. By clicking this group you will open bets added to the favorites. How can I change the color display of the offer? In the picture below we have marked additional options which allow you to choose a display of the the desired offer. There is an option of showing only leagues and by clicking a league all bets for this league will show. What does ''Complete offer'' option mean? If you want to se the complete offer without the limitation of the dates by clicking the button ''More'' you will be shown the ''Complete offer'' option which will show only pairs in the current offer. As well, there is a calendar to enable you to choose an offer for the next five weeks. How can I see additional bets? Ponuda je organizirana na način da se inicijalno prikazuju samo osnovna klađenja dok su dodatna klađenja grupirana u srodne gupe (Klađenje na golove, Klađenje na kartone ...). Klikom na pojedinu grupu dobivate popis svih klađenja iz odabrane grupe. How can I request prepayout? Prepayout is an option by which you can request payout even before the end of all bets. When the prepayout is allowed you will see a button ''Request prepayout'' and the amount which is possible to payout as seen in the picture below. The condition for prepayout is that in the moment of the request for the prepayout none of the chosen pairs are currently running. As well as, prepayout is not possible to request in system betting as well as in the tickets placed using a promo bonus. How can I track results of played pairs? If a pair is running, on the ticket the current result will be displayed in red color. Results marked in red will mark the final score. By clicking the displayed result a window will open with additional results details. When is the ''Make bets on remaining pairs'' option displayed? If a ticket is losing and there are still pairs left which had not started a button ''Make bets on remaining pairs'' will show. 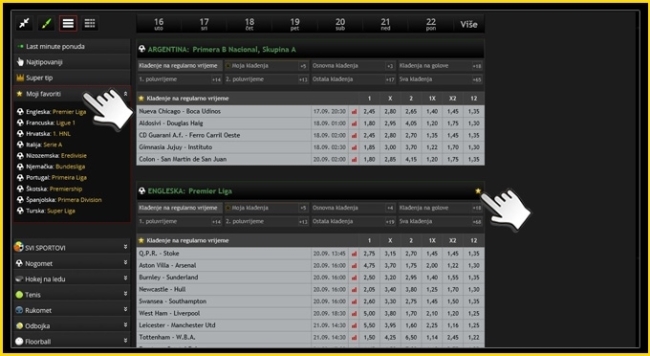 By clicking the button a new page ''Sport'' will open and show a prepared ticket with remaining pairs which are awaited. This way you can rebet on remaining pairs very quickly.